So magic is a big hit for birthday celebrations! Last weekend I performed for Mike’s 50th birthday party at a church in Olympia. Some sixty of his family and friends were there for the occasion, including his daughter from the east coast. You only turn 50 once! Mike’s daughter and son-in-law saw me in December at a company holiday party and knew I’d be perfect for this occasion. Mike is a big fan of magic and an amateur magician himself, so I brought some special close-up magic that I was sure he hadn’t seen on TV or from another magician. Afterwards, it was time for the “main event” and I took the stage for my stand-up show. The church was the perfect venue; stage, state of the art sound system and lighting, and great acoustics. Mike was kind to share some comments from the evening. 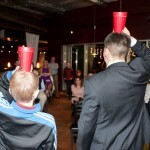 Michael and Alison… and one heckuva card trick! 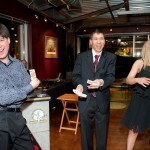 “I hired Jeff as entertainment for my husband’s 50th birthday celebration. Jeff is amazing! He is personable and professional. The reactions of our guests were priceless. His show is wonderful, mind blowing, funny and appropriate for all ages. I placed so much love, time and effort in planning a beautiful celebration for my husband with our dearest family and friends. Jeff added that special touch to make the evening magical and memorable for all. Check out this gallery with more photos from a 40th birthday party at The Venue in Tacoma. 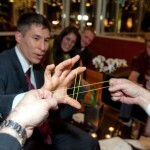 Interested in learning more about adding magic to your special birthday party? Send a note to jeff@amazementproductions.com or call me in Olympia toll-free (877) 412-5064 to learn how to make your celebration fun and unforgettable. This entry was posted in Uncategorized and tagged 40th birthday, 50th birthday, 60th birthday, birthday party, magic, magic show, magician, Olympia, Seattle. Bookmark the permalink.